During the Belle Epoque, Montmartre was bustling with impoverished artists, lured there by the cheap rent and the fact that there were plenty of other impoverished artists to hang out with. These days, the streets are positively pumping with tourists, pickpockets, and tricksters with three cups and a ball. 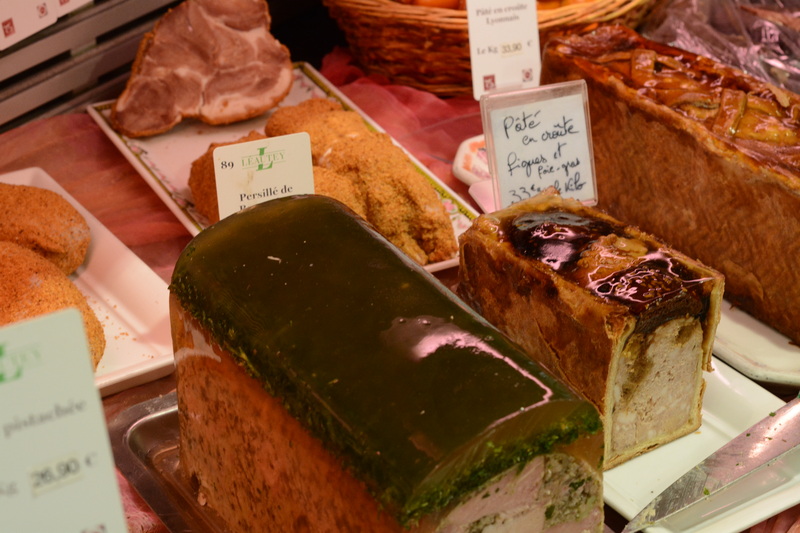 To help us navigate through the winding streets, and let’s face it, to feed us French delicacies, we took a Secret Food Tour. A whole heap of macarons. Our guide Ella met us at Anvers metro station, and after a brief but informative history lesson about the area, we started walking up the Rue de Steinkerque, a street absolutely jam packed with tourists shuffling up the hill towards Sacre Coeur. Within minutes though, we had turned a few corners and found ourselves on quiet little side streets, where you didn’t have to clutch your bag to your chest and you could stand and stare into a tempting shop window without being jostled and bumped constantly. 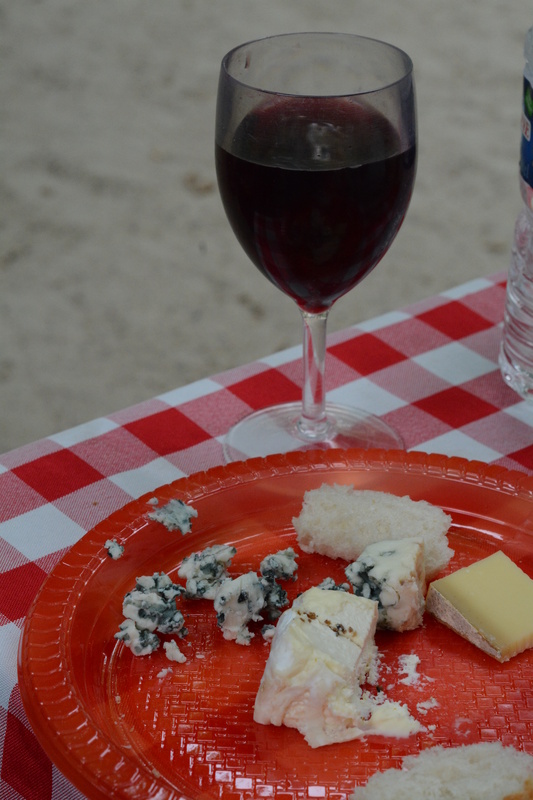 This tour focusses firmly on food, but throws in some history, French culture and plenty of good humour along the way. We learnt how to pick the difference between a gimmicky touristy shop and the real deal. At every shop we visited, Ella would collect a few delicious treats for us that would form our picnic lunch at the end of the tour. 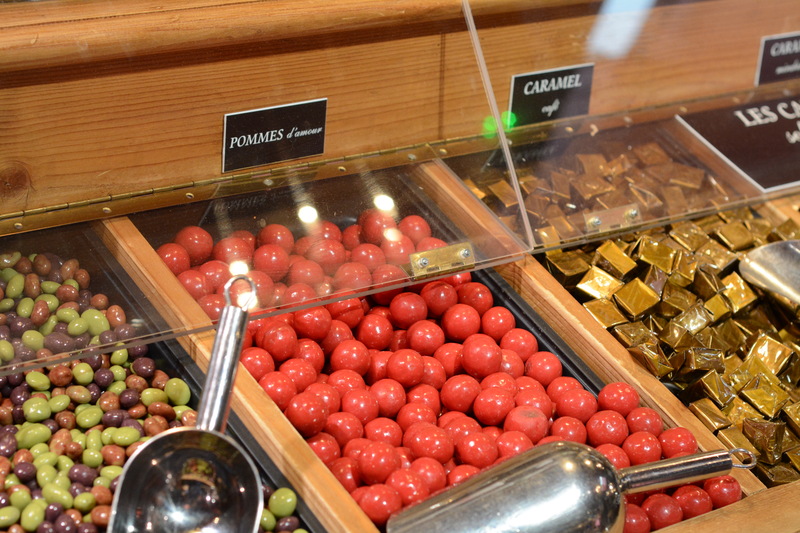 We started with chocolate at Maison Georges Larnicol where amazing chocolate sculptures hog the limelight. At a macaron shop – Christophe Roussel – we literally drooled over amazing flavour combinations like pistachio and sour cherry. I mean seriously. 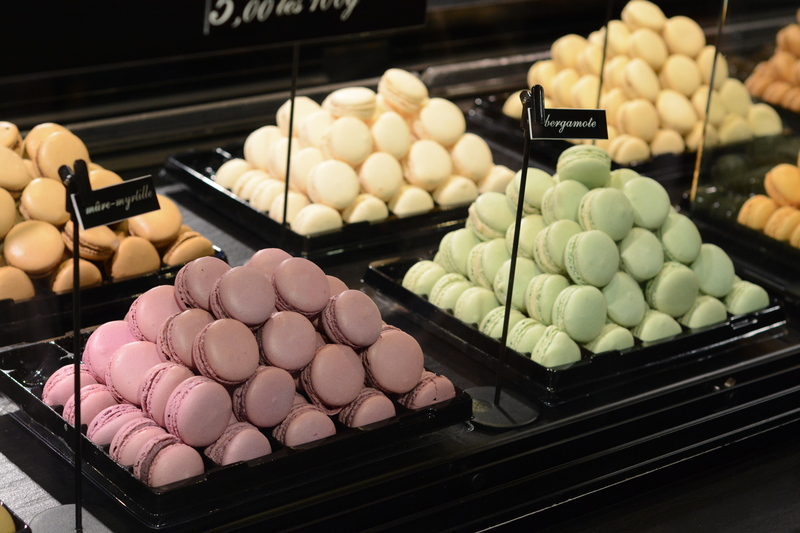 I could have stayed in that shop all day, and I didn’t think I even liked macarons. 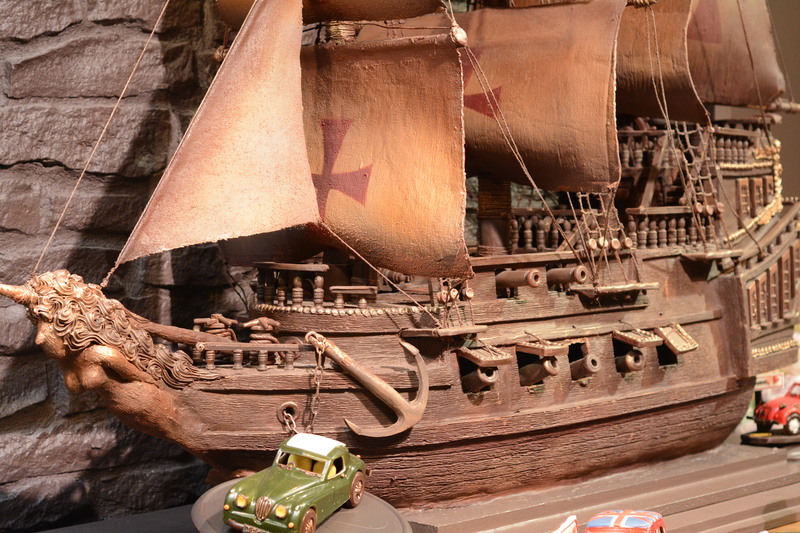 This is an actual ship made of actual chocolate. I don’t know why it’s a thing, but it’s amazing! 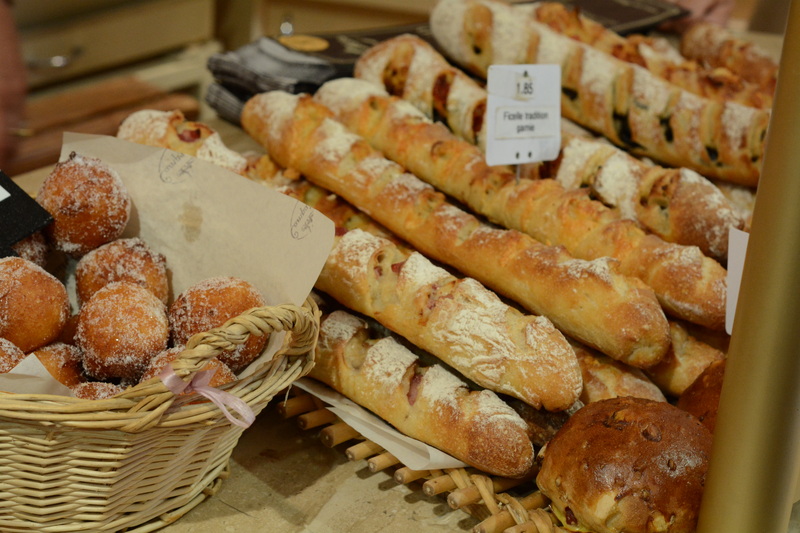 At the bakery that made the best baguette in Paris in 2011 – could there be any higher honour? – we learnt that the honour comes with a year long commitment to supply the prime minister with a baguette and a croissant every single morning. We still don’t know where the president gets his bread though, so clearly Ella didn’t know EVERYTHING. She did enlighten us as to why the baguette is shaped that way (to avoid knife fights, believe it or not) and why you shouldn’t ever place your baguette upside down on your plate. Bread. Lots of lovely bread. And all this lovely cheese! 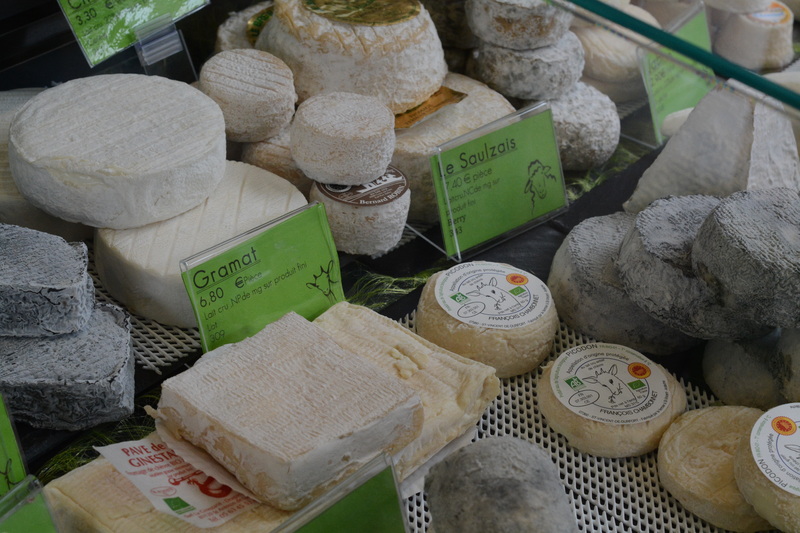 We prodded mystery meat products at the charcuterie and marvelled at the enormous array of cheeses at the fromagerie. Our final stop before our picnic lunch was at a wine shop, where Ella taught us a few tricks to pick a good bottle of wine, without having to know anything about French wine. Also, did you know it’s illegal for vineyard owners to water their vines? No, me either. A bunch of mysterious meat products. More delicious than I anticipated! With all our delicious goodies in hand, we headed for a gorgeous little park where Ella set up a picnic table, with compulsory red and white checked table cloth. She then set out a huge array of the delicacies that we had acquired along the way. There was WAY too much food, and as we happened to be the only two participants on this particular tour (this was a fluke, because the tour that left half an hour earlier had about eight) Ella carefully wrapped up all the leftovers and sent them home with us. Everything was utterly delicious, and Ella’s company was delightful. She was happy to answer all of our ridiculous questions about life in Paris, and by the end of it, we felt like we’d just had a picnic with a friend. Our picnic in the park. First course! Except that it wasn’t the end. 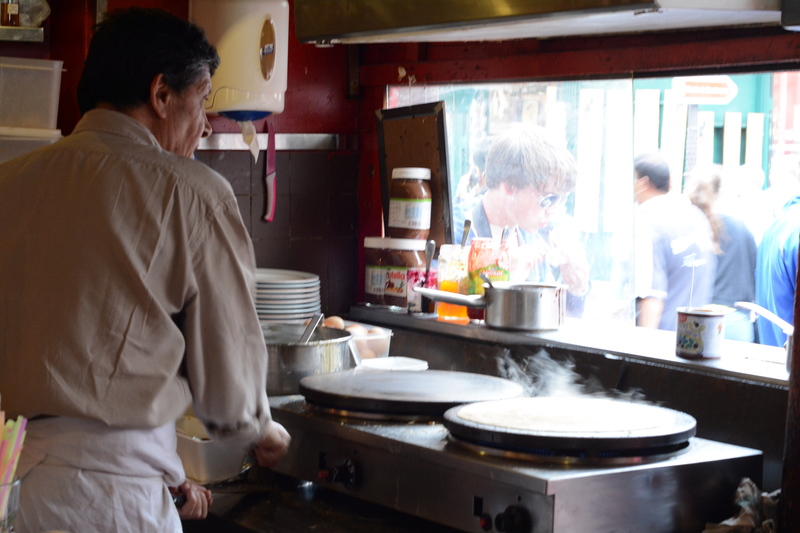 Just when we thought we couldn’t fit another thing in, we wandered along to a historic creperie to pick a crepe for dessert. I went for the chestnut puree crepe because I thought I’d try something different. I think it might be an acquired taste! Our crepe maker doing is thing. At that point, we realised we were basically at the foot of Sacre Coeur, back in the throng of visitors. Ella waved us goodbye and with a bag full of leftovers, we skipped back down the famous Montmartre steps. The Secret Food Tour cost €89 per person, and for that you get three hours of entertaining and informative commentary from your guide. You deviate from the regular tourist path and learn how to pick a fantastic food supplier. You also get a LOT of food – more than we could eat – and get to learn a lot about Montmartre and Paris. We loved it. Yep, gorge. That’s definitely what we did!